Jewel Box is another in the series of paintings I have been doing of Mudgeeraba Creek. I was walking along the edge of the creek one day when I noticed a shaft of light coming in between the tree branches and lighting up the stones on the floor of the creek with a golden glow. The richness of the reflections of leaves and branches, and the shapes and colours of the underlying rocks seemed to create a complicated sort of Rococco pattern; not a collection of mundane objects, but a secret cache of precious things. That’s why I’ve called the work ‘Jewel Box’. 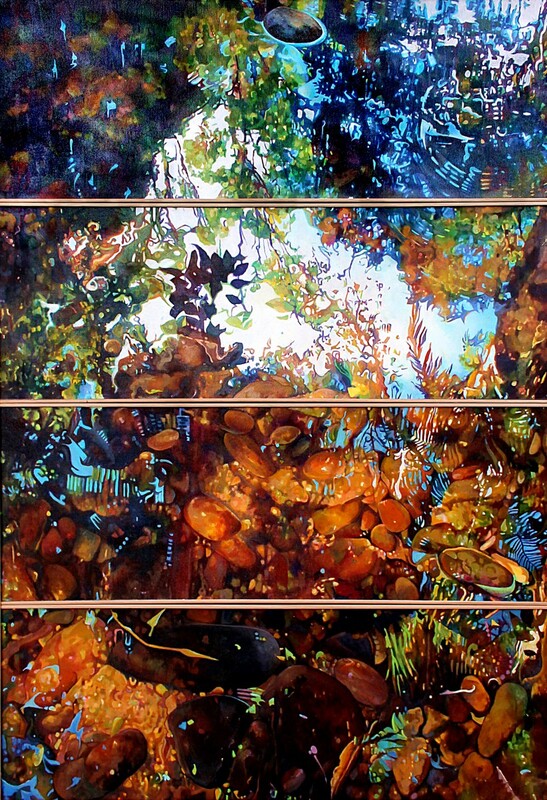 Three views of Mudgeeraba Creek – 3x panels oil on canvas, mounted on board, 40x80cms each, overall 120×80 approx. Susan Skuse 2015. I came up with this work as part of my Fine Arts Degree work and finished it up for the d’Arcy Doyle Award. I’m happy to report that the painting has found a new home, and, not only that, but another artlover has commissioned a similar work. I’m beginning to feel that I might have found my art “niche”. For anyone who is interested in such things, here is my artist statement relating to this work, explaining the thought process behind it. The aim of my painting is the appreciation of the natural world as a unity in which we are not objective observers, but an integral and undifferentiated part. For me, this involves painting in a realistic style and with an attachment to place. My recent work has been based on a single place; a rainforest stream near my home. It is not that there is anything special about this place; there are thousands, perhaps millions of such places where the basic elements of water, rock, light and vegetation come together. In Zen Buddhism there is a term, kensho, which implies a momentary enlightenment wherein one “sees nature” and also sees one’s own nature, with the sense that there is no duality between the ‘seer’ and the ‘seen’. My goal is for my painting to open the door to a such an experience. In the set of three, titled ‘Focus Shirt, the top panel shows a distant view, which reads as a conventional landscape painting. In the second panel , the middle ground, the patterns of shapes are becoming more abstract, and in the bottom panel they are rendered more abstractly again, with primary interest being on the distorted shapes created by moving water and the colours. 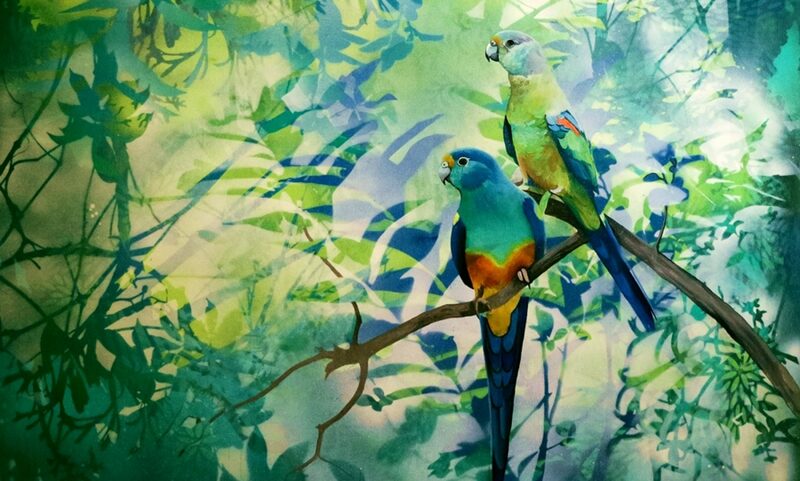 Art Lovers Australia Art Prize – what a lovely surprise! To be the winner, that is.